It is only four days until Christmas and I am not prepared. I have 15 people, spanning four generations of three families coming for dinner and I have no idea what I’m serving. I purchased festive paper plates since I couldn’t face dragging out my 12 different patterns of Christmas china this year. 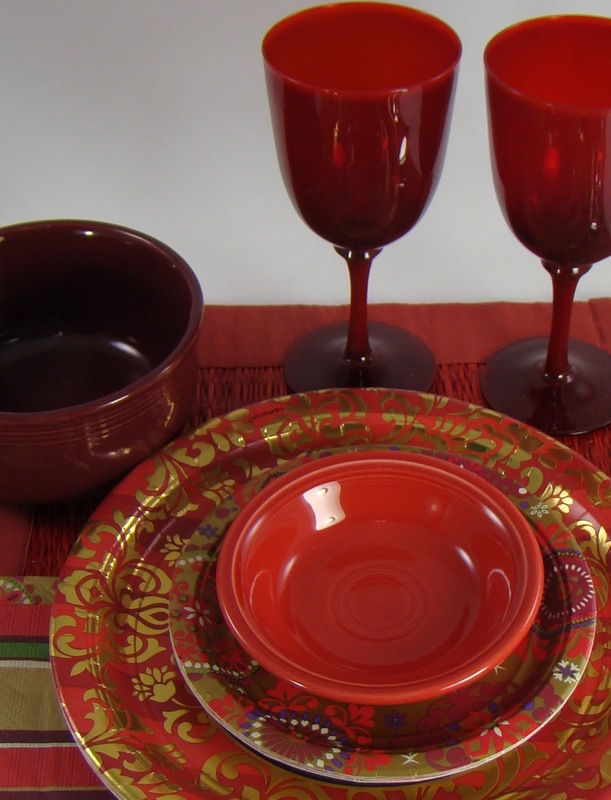 And I found red wine glasses on sale for half price! I’ve wanted an excuse to buy red glassware for a long time. My blue crystal just doesn’t work for Christmas. But what are we going to eat? While searching through my vast collection of cooking magazines and books, I came across a Hanukkah menu in an old Bon Appetit Magazine that sounded really appealing. Not for Christmas dinner, but to cook for ourselves over the weekend. It’s a good thing we didn’t try to cook it for guests, because we failed to read the recipe in advance and it actually took us two days to cook the meat. We didn’t start early enough in the day to have it ready for dinner. The latkes did not turn out well at all – they were very mushy, but the applesauce was great. And the brisket was divine. We will definitely make it again. Preheat oven to 300 degrees. Whisk wine, broth, cranberry concentrate and flour to blend in medium bowl, pour into roasting pan. Mix in onion, garlic and rosemary. Sprinkle brisket on all sides with salt and pepper. Place brisket, fat side up, in roasting pan. Spoon wine mixture over. Cover pan tightly with heavy-duty foil. Bake until very tender, basting with pan juices every hour, about 3 ½ hours. Transfer brisket to plate. Cool 1 hour at room temperature. Thinly slice brisket across the grain. Arrange slices in pan with sauce, overlapping slices slightly. Brisket can be prepared 2 days ahead. Cover and refrigerate. Preheat oven to 350 degrees. 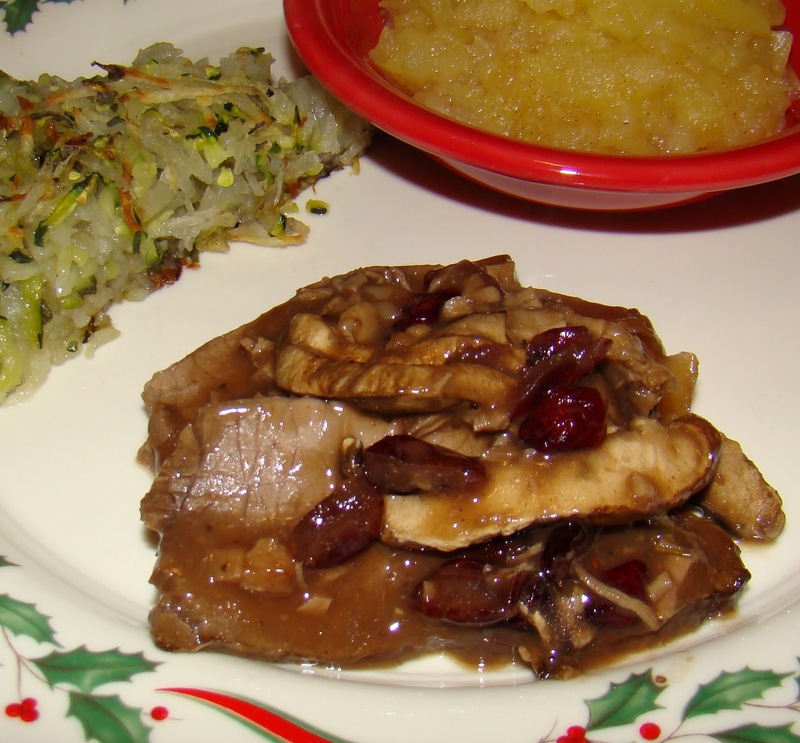 Place mushrooms and cranberries around brisket in sauce. Cover pan and bake about 30 minutes until mushrooms are tender (40 minutes if it has been refrigerated). Now, how do you get an appetizing photo of brisket? And more importantly, WHAT AM I GOING TO SERVE FOR CHRISTMAS DINNER???!!! Brisket does take a long time. I bought a rib eye roast last year and it was amazing, just a little pricey! Wishing you and your family Happy Holidays. p.s. I use paper too, but out of necessity, I don't have enough regular plates for everyone. I actually love paper plates and have been known to have a party based on paper plates that caught my attention. Paper gives you lots of flexibility. I love seeing what other people whip up for holiday meals. The time for the brisket doesn't seem too long, I've had one on the slow cooker for 8 hours before. This year I am doing something I have only done one other time, staying at a resort where somebody else is cooking! While that means I will some out on the fun I do actually enjoy, after the fall I've had I think I will deal with it just fine. I'm Published on the Smithsonian Blog!! !